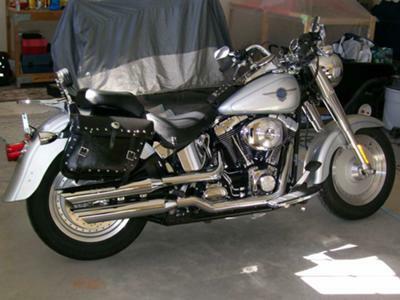 I have my 2002 Harley Fat Boy for Sale in South Carolina. It's a Metallic Ice Silver FLSTF with under 10K miles on it. It's super clean with lots of Chrome, a Harley Davidson anti-theft alarm system, Screamin' Eagle exhaust pipes and air intake, a Tachometer, saddlebag supports and an extra set of mirrors will be included in the deal. The 2002 Harley Fat Boy for Sale has been exclusively garage kept aand I'm asking $12,000 US OBO. GoGoCycles would also encourage bikers to submit a review of the 2002 Harley Fat Boy for Sale to help potential buyers make informed decisions and to benefit the biker community as a whole. If you're interested you can contact me using the space below provided by GoGoCycles Used Motorcycles for Sale and the owner, Michael, will get back with you as soon as possible.